In 1976, Katherine Paterson's son David was 8 years old when his friend, Lisa Hill, was struck by lightning and killed. 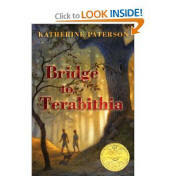 A year later Bridge to Terabithia was published, winning a Newberry Medal and becoming, if such a thing is possible, an instant classic. Ms Paterson drew upon this personal tragedy to create the story of a boy, Jess Aarons, and a girl, Leslie Burke, in rural Virginia, who become the best of friends. Jess is the middle child, and only son, of a reticent father, who struggles to earn a living. Leslie is the daughter, and only child, of two successful writers who have moved to the country, next door to the Aarons, for lifestyle reasons. The friendship between the two kids is hesitant at first, particularly after Leslie usurps Jess's title as the fastest runner in their 5th grade class at Lark Creek Elementary. But both have some trouble fitting in with theirs peers, Jess because of his interest in Art, Leslie because of her scholastic ability and her parents' very 70s social attitudes (like not having a TV), and this shared awkwardness gives them a unique bond. Leslie creates an imaginary kingdom called Terabithia for them to rule over, accessible only be a rope swing over a local creek. The imaginary adventures they share there and a series of incidents at school bring the two closer and closer together. But then an ugly reality intrudes upon their idyllic world and the various characters are forced to deal with a tragic death. Build a bridge across the stream instead of using a rope. What causes flash floods? Design a set of chairs for a king and queen to sit on. Design a portable box for Jesses art supplies. This short story shows how profoundly one person can change another's life, and also indirectly portrays many types of love.